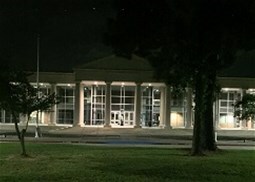 Klein Collins High School is located on a 117.5-acre site at 20811 Ella Boulevard, in Klein, Texas. The architectural firm of RWS Architects designed the 555,000 square foot facility. The contract to build the school was awarded on May 10, 1999, to Marshall Construction Co. Klein Collins was built with a capacity of 3100 students at a cost of $51,000,000 exclusive of furniture and equipment. Built in two phases, the school opened August 9, 2001, with an enrollment of 1092. March 3, 1995 was recognized by the Senate of the State of Texas and Klein ISD as Don Collins Day in Klein, Texas. A prominent educator in the State of Texas, Dr. Collins served as superintendent of the Klein Independent School District for 29 years. After serving as a teacher, principal, supervisor, and assistant superintendent in the Houston Independent School District, Dr. Collins became superintendent of Klein Independent School District in March of 1971. A talented and exemplary individual, Dr. Collins is greatly admired by his colleagues in education and by members of the community; in 1987, the Texas Association of School Boards named him Co-Superintendent of the Year in Texas. A leader in his field, Dr. Collins organized Klein's first district-wide volunteer program in 1971; this highly successful program utilizes parent and community volunteers in the schools. He also established the tradition of Germanfest, the annual celebration of the German heritage of the Klein community. During Dr. Collins's tenure, the Klein Independent School District grew from 2,700 students on six campuses in 1971 to 31,835 students on 28 campuses in 2000. Dr. Collins was named chairperson of the State Textbook Committee in 1980 and was honored as a Distinguished Alumnus in 1988 by the College of Education Alumni Association at the University of Houston. Dr. Collins's distinguished leadership has contributed greatly to the growth and quality of education in the Klein community, and he has played a major role in making the Klein Independent School District the exceptional school system it is today.